Ta Da! I went to a new groomer yesterday! You like? You’d think I’d choke myself sleeping this way in my bucket. This is my “before” picture. Oh boy! No more hairy face and ears. Woot Mon! Pay no attention to my snaggletooth look. I lost that bottom tooth in a fair fight with a fence. It was a noble act and very Scottie-like. This is my “after” picture. Actually, you can’t tell much of a difference can you? Try this little movie on for size. You might get a better idea if how great I look – if you can get past the peep being silly. 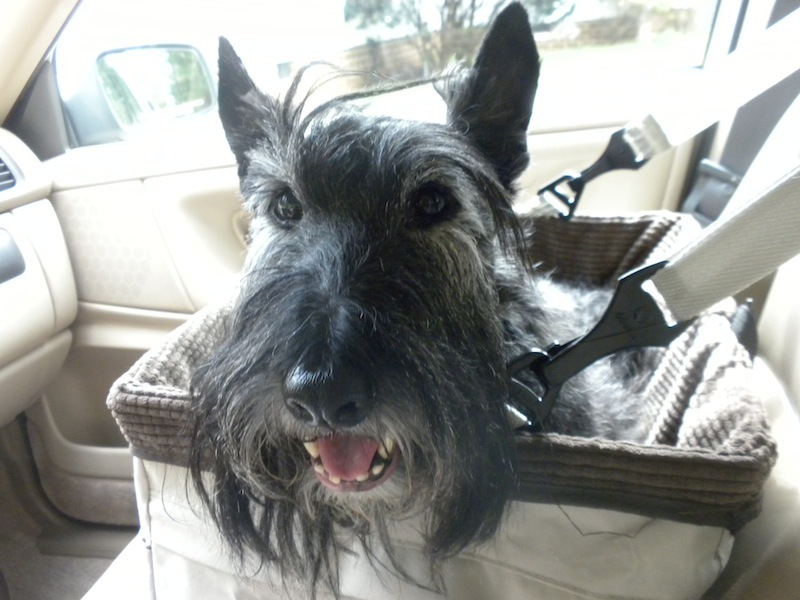 This entry was posted in The Scottie Chronicles and tagged animals, dog grooming, dogs, pets, Scotties, Scottish Terriers. Bookmark the permalink. Oh, boy, Stuart, you look like a million bucks! Great job! We think the new groomer did a wonderful job and you must have been very well behaved! Both of you must have been a little nervous since it was the first time. Have you seen yourself in the mirror yet? We think your peep found a keeper with this groomer. Thanks a bunch buddies! It was a piece ‘o cake. She was really nice. I don’t do mirrors very well. I never know who that guy is. OH Thank you Rocky Creek Queen! Did I tell you the peep is thinking about learning how to do it? Did she give you a carrot tail or a feather tail? Your head is looking good. Um…well….about my tail. That still looks like a BIG bent pipe cleaner. We haven’t tackled the tail yet. Sad, I know, but thanks for asking. When We do, it’ll be of the carrot variety. Oh boy, Stu! You look Scott-tastic, and even younger! So do you think that you will be keeping that groomer even though she is kinda far away? You are so handsome! We’ll bet that you turned heads of people passing in cars! 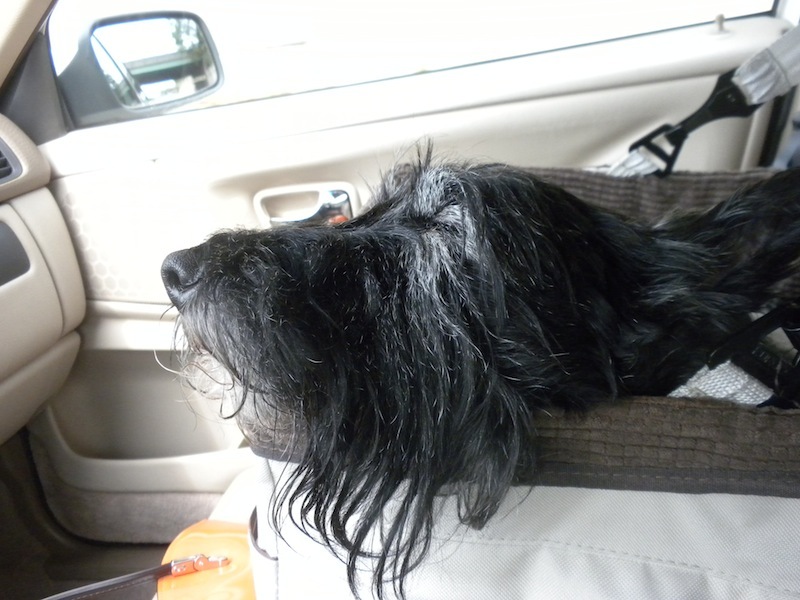 Love and kisses to a very HANDSOME and well-behaved Scottie Ladie! Got the kissed! I’m talented that way. I pull them down from the atmosphere whenever they’re sent my way and I really appreciate that talent of mine. I think I will go back! She’s a keeper! Uh…make that “got the kisses” Can’t spell. Make that Laddie—I can’ts spell either! BOL! It’s hard to improve on perfection so let’s just say your ‘fine tuning’ looks magnificent! Stuey…YOU LOOK FABULOUS DARLING, SIMPLY FAB! My pal, thank you for that. How are you guys? Woot to my Whitely Westie friend! Stuart you look more than terrific ~ you are the old Stuart back. Thank you buddy. It was rough there for a while…. You are so bright eyed! We think you look so very regal. She shaved at least 5 years off ya.Great job! Woot!!!! Now THAT’S a compliment! Much obliged. HEY! Steer clear of that WAKEEN!!!!! You’re too close for comfort my friend! Stay away from the sharp implements if the peep is jittery!!!!! You’re always right! It takes Us about a half hour to get there – one way. Not too, too bad. AND SHE HAND STRIPS!!!!!! Plus, she’s very nice. Her place is very clean and very quiet. She only does a few dogs a day. Not a gazillion. I mean really. A gazillion? With moi around? I think not. Oh, thanks fer the link, pal! I’ll get Ma ta check on it Instanter 🐀🐀 Sending ya couple of rodents for yer treat! Would she travel to Nebraska? Probably not……. Gosh Stuart, the groomer did a great job and you look happy a and relaxed. Guess you will be going back for future needs? I sure am. Lucky me! Thank you! Sorry, furgot ta mention we liked the movie A lot!! Us three. Your mom has a nice voice. You can tell she really LOVES you! I don’t think you’d EVER be defenseless. Really. Do you? Naw. You look grreat, Stuart! Very distinguished.